Themes from several of Gilbert’s Bab Ballads were used for the libretto of H.M.S. Pinafore (1878). The opera eventually became a great success at the Opera Comique in London, and Carte launched a traveling company to play Pinafore in other English cities. Before long, the first American production opened at the Boston Museum. The popularity of Pinafore became extreme. An estimated 150 unauthorized and often altered productions spread quickly across the United States, including regional burlesque versions. It was not unusual for two or three competing productions to play simultaneously in the larger cities. Juvenile Pinafore companies featuring young children became especially popular, and caused a furor with opponents of child labor. (Carte followed suit and produced a children’s version in London.) Catch phrases and songs from the opera became part of everyday life, and Americans found Pinafore scenes on a variety of consumer goods and advertising. 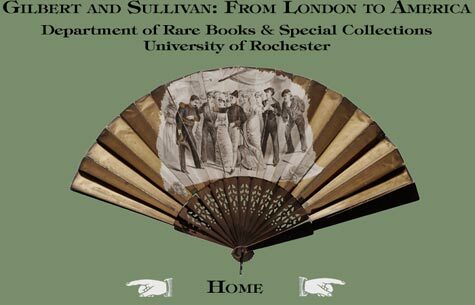 Because of the lack of an international copyright agreement, Gilbert and Sullivan received little of the earnings generated by the “Pinafore Craze.” Gilbert, Sullivan and Carte traveled to America and mounted an authorized production of H.M.S. 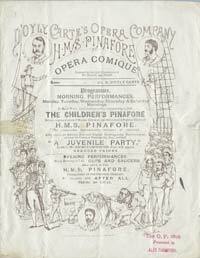 Pinafore, while completing plans to open their next opera in New York in order to secure copyright privileges. [Program]. London: Opera Comique, . Original production of H.M.S. Pinafore. [Program]. 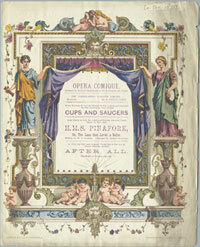 London: Opera Comique, n.d. . Illustrations by Morehen. D’Oyly Carte’s original children's H.M.S. Pinafore production. The lithographed scene from H.M.S. Pinafore probably represents the Standard Theatre (New York) production. [Program.] 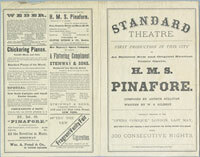 New York: Standard Theatre, Jan. 25, 1879. First New York production of H.M.S. Pinafore. [Cabinet photograph]. Boston: Warren, . 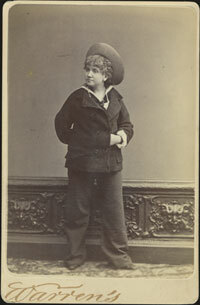 Rose Temple as Ralph in the first American production of H.M.S. Pinafore. [Unidentified correspondent "Will".] Autograph letter signed. 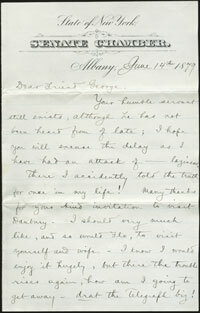 To unidentified recipient "George". New York State Senate, June 14, 1879. Four pages, small 8vo. A detailed letter describing Pinafore-mania in Albany, New York. [Metal knife.] N.p., (ca. 1880). Handle with ship "H.M.S. Pinafore" on one side; sailor "Ralph" on verso. [Thomas H. Simpson.] J.R.C. Freight Boat Sarah Jane. A Burlesque on Pinafore. Lynchburg Va: Virginian Book and Job Print, 1884. 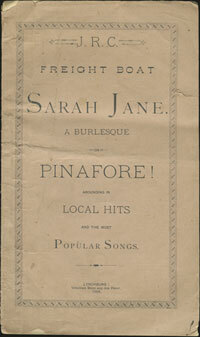 Libretto for a local burlesque minstrel version of Pinafore. Originally printed in 1880, the libretto was reprinted for performances in 1881, 1884 and 1889 with topical changes in lyrics. Only the 1889 printing lists Thomas H. Simpson as the author. J.R.C. presumably refers to James River Canal. [Cabinet photograph.] Boston: Notman & Campbell, . 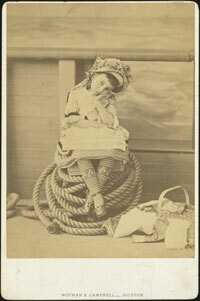 Little Corinne as Little Buttercup in the Boston Museum children’s production of H.M.S. Pinafore. [Broadside]. Boston: Boston Museum [July 1879]. The Boston Boys and Girls Pinafore Company in H.M.S. Pinafore.